Today, we’re heading off to the Kingdom of Auradon! 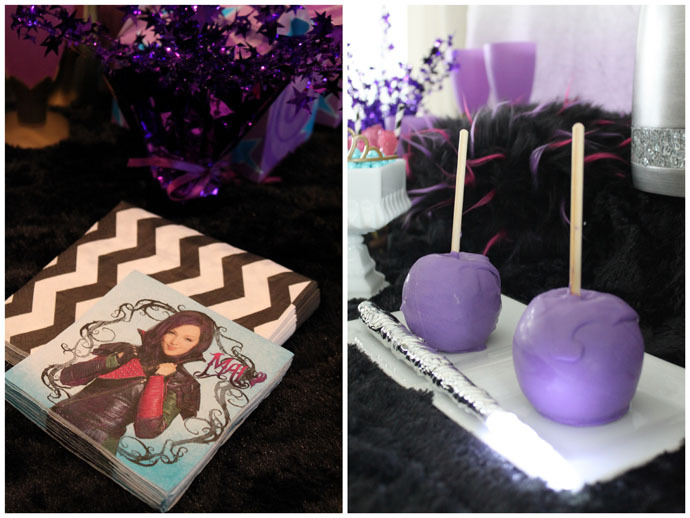 Disney Descendants fans, grab your poisonous apples, magic mirrors and wands, and get ready to throw one seriously awesome and evil birthday party! In the movie, the Descendants of some of the most villainous characters in Disney history are exiled to live on the Isle of the Lost until Prince Ben, the teenage son of King Adam (a.k.a. The Prince Formerly Known as The Beast) and Queen Belle decided to change this ruling. He invites Carlos, son of Cruella De Vil; Jay, son of Jafar; Mal, daughter of Maleficent; and Evie, daughter of The Evil Queen to live in Auradon and attend high school at Auradon Prep. There are so many great characters in this movie, you can easily pick your favorite to base your party around. 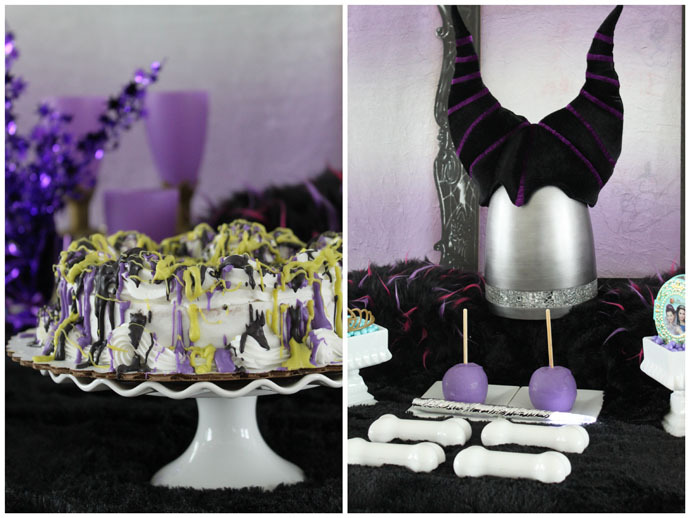 I focused this party around the characters Maleficent and her daughter, Mal. If you look closely you will find hints of the other characters in this party too! Mal and Maleficent both wear lots of purple and black, so I chose to use those as my main party colors. 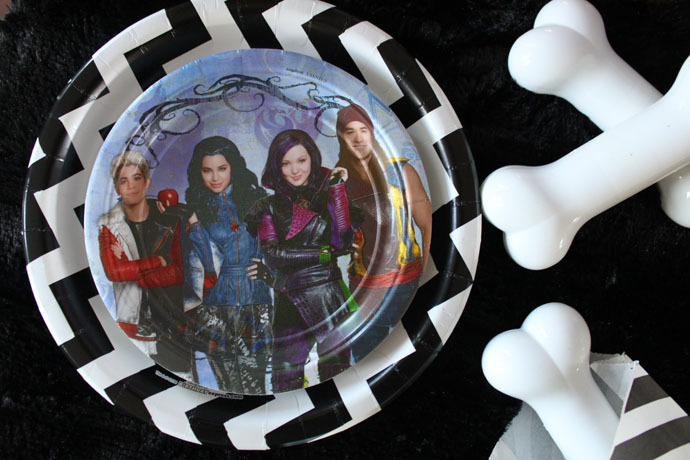 For example, I used these black and white chevron plates to pair with the purple and blue tones of these Descendants plates. 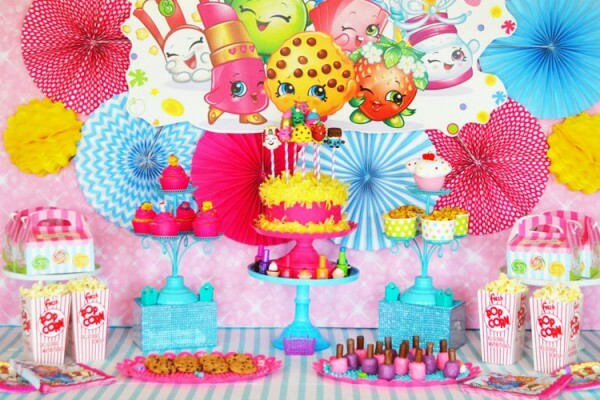 I like to try and think outside the box a little when looking for serving ware, tablecloths, and backdrops to coordinate with my party supplies. 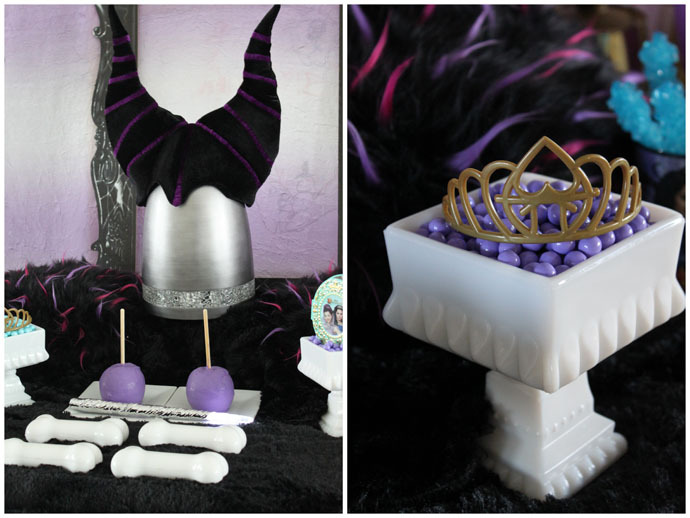 When I got Birthday Express’ Descendants party supplies, I knew I had to use Maleficent’s head piece as a centerpiece! It’s sitting on an upside metallic wastebasket — I loved the sparkle accent and shiny silver look that it brought to the table. Then, my tablecloth is a fuzzy black comforter, and my backdrop is a purple and white ombre curtain panel. I hung two black paper chandeliers on either side of the table and used an over-sized cardboard frame to display Maleficent’s hat as a work of art. Carlos, son of Cruella De Vil, would approve of these dog bone crayon cases! 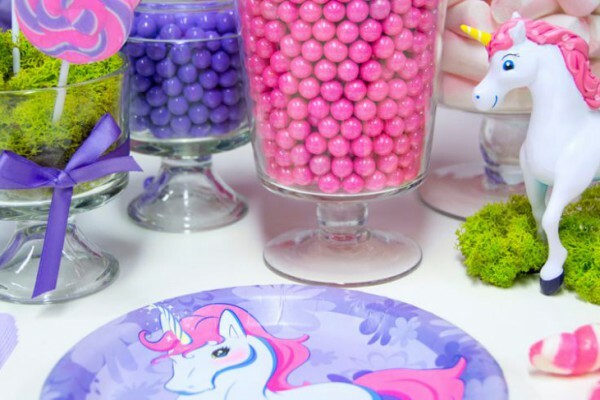 Wouldn’t they make great party favors? 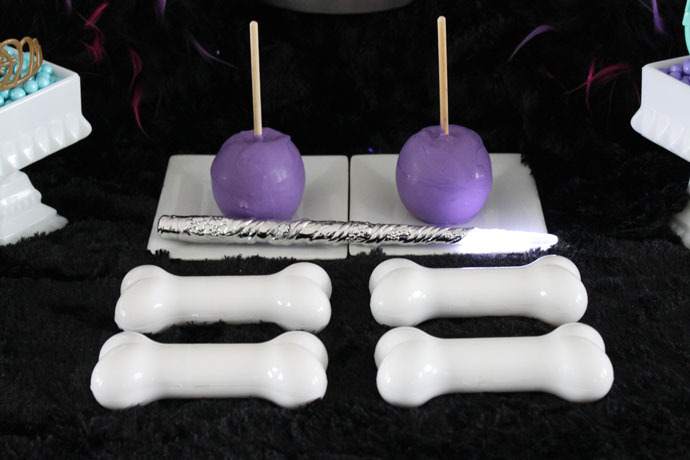 Each dog bone case holds six different color crayons inside, but you can swap them out for other party favors or sweets too. I found white pedestal candy jars at my local thrift sore and filled them with blue and purple sixlets. I then placed these two Disney Descendant cake toppers (Evie’s gold compact and Mal’s gold coronation tiara) on top of each filled candy pedestal. I kept the dessert ideas simple for this party: a D.I.Y.-ish birthday cake, and some candy apples. Of course Descendants napkins were the perfect fit as well! To create these purple “poisonous” apples, I started by melting some chocolate – you can use melting chocolate that’s already dyed purple, or mix red and blue food coloring with white chocolate. The easiest way to melt chocolate is in the microwave. Use medium low heat in short bursts (30-60 seconds) and stir well in between each heating. Then, dip the melted chocolate onto the pointed end of a small wooden dessert stick (sold in the dessert section next to cake pop sticks), and place into the center of an apple. Popsicle sticks or wood skewers work too. Dipping the stick by itself first lets the chocolate “glue” the apple to the stick, which will help keep the apple from slipping off later. Let it dry, then dip the entire apple in the melted chocolate. Tap off any excess and immediately add sprinkles, candy, nuts, or any other toppings to the candy apple. Place on wax paper to let dry. Finally, every birthday party needs a birthday cake! So, I grabbed my fairy godmother wand, said some magic words, and conjured up this one. 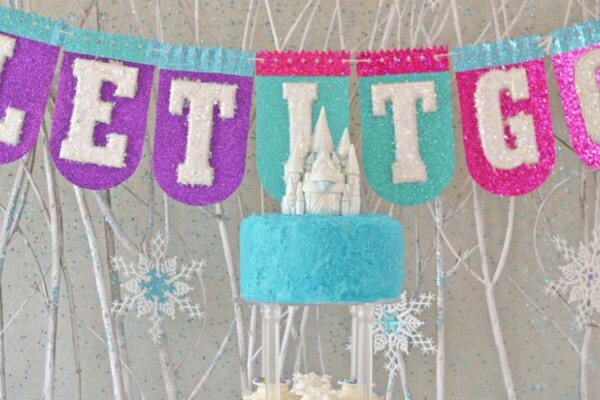 Find a basic, white-frosted, store-bought cake and remove any existing decorations. 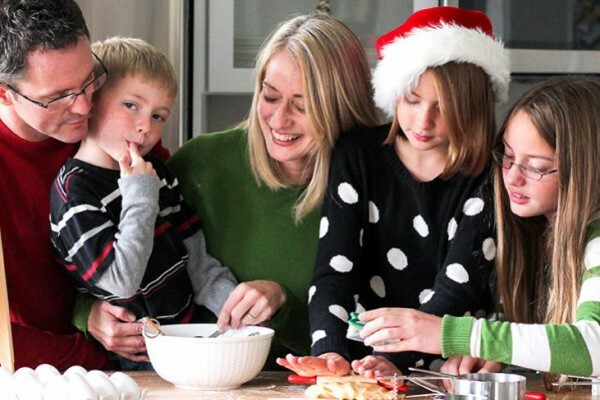 You can, of course, bake up a plain white cake in your child’s favorite flavor, too. To decorate, melt some batches of your desired colored chocolates. 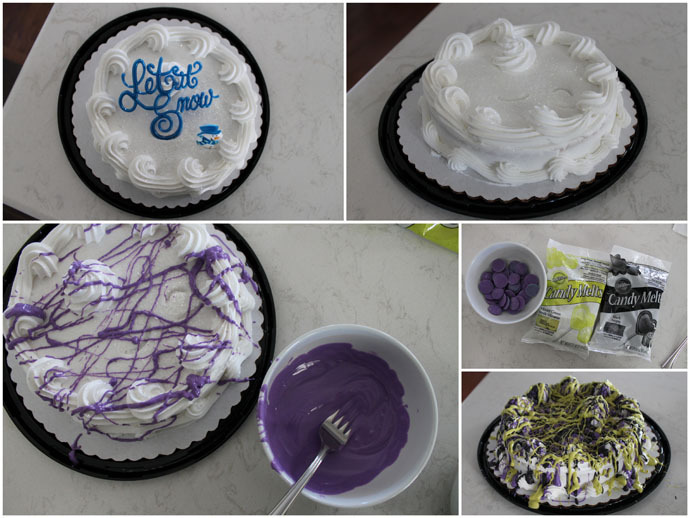 I used bright purple (the same as I used for the apples), black, and lime green. 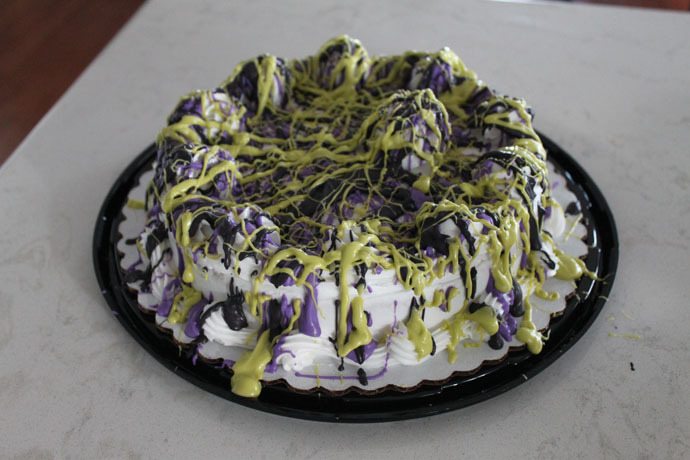 With a fork or spoon, drizzle and splatter the chocolate directly onto cake. Repeat this process with other colors to create a layered splattered look. Here’s the finished product, yum! My number one suggestion is to try going back and forth with lots of crisscrossing lines in different colors. If you have a revolving cake stand, you can simply rotate the cake around while adding chocolate. I hope this inspires you to conjure up a little party magic of your own! 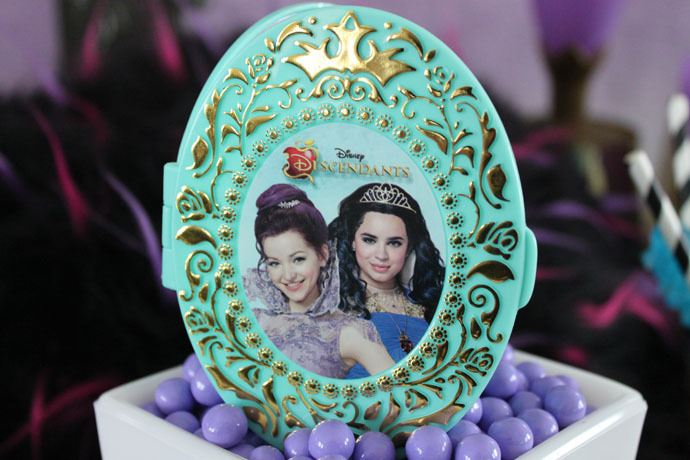 Shop the complete collection of Descendants Party Supplies on Birthday Express.